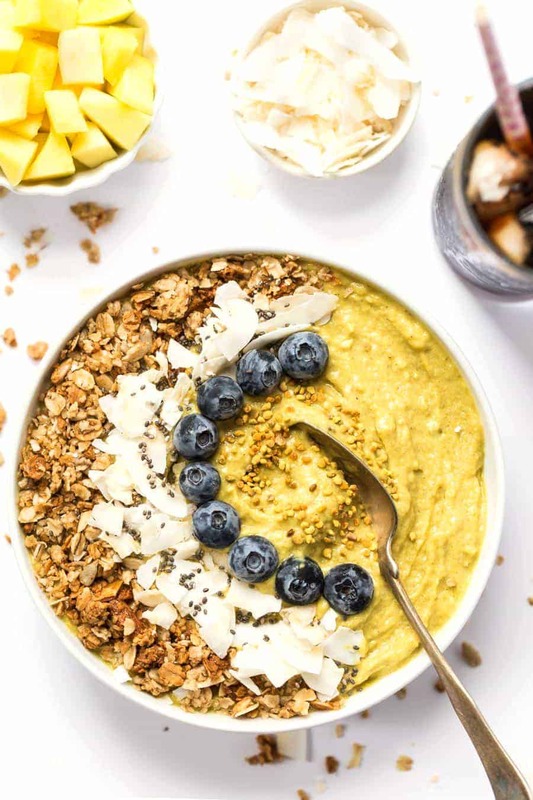 This delicious Mango Smoothie Bowl is made with fruits, veggies and superfoods to give you fiber, nutrients and a boost of vitamins in the morning! Disclosure: This recipe is brought to you in partnership with Starbucks. I was compensated and given free product to create this post. As always, all opinions are my own. I only share companies I love and trust, so thank you for continuing to support Simply Quinoa! Wouldn't it be great if we could wake up every morning feeling totally energized and ready to go? For some, I guess that's possible, but for most, let's just be honest and say we'd rather stay in bed for another hour. But as someone who works full time and runs my own business, sleeping in is often not the norm around here. And I'm sure you're probably in the same boat. There's stuff that needs to get done and even though we'd rather be sleeping, we need to get our booties in gear and the day started. One of the things that has helped me get the most out of my day and keep me on my A-game, is to have a morning routine. I've talked a little bit about my routine before, but in the last few months it's changed a bit and now I'm feeling more productive than ever! My day always starts with a huge glass of water. This is a great way to rehydrate after a long night’s sleep. From there it's time for my morning walk + morning beverage. In the wintertime, I like to take warm lemon water or matcha with me, but now that we're in the heat of summer, I need something more refreshing. What I found that hit all my criteria? 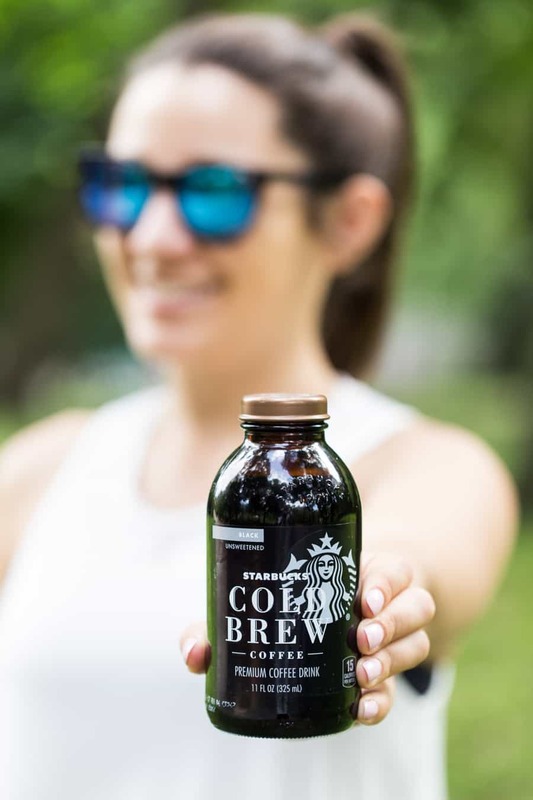 Starbucks® Cold Brew Coffee! 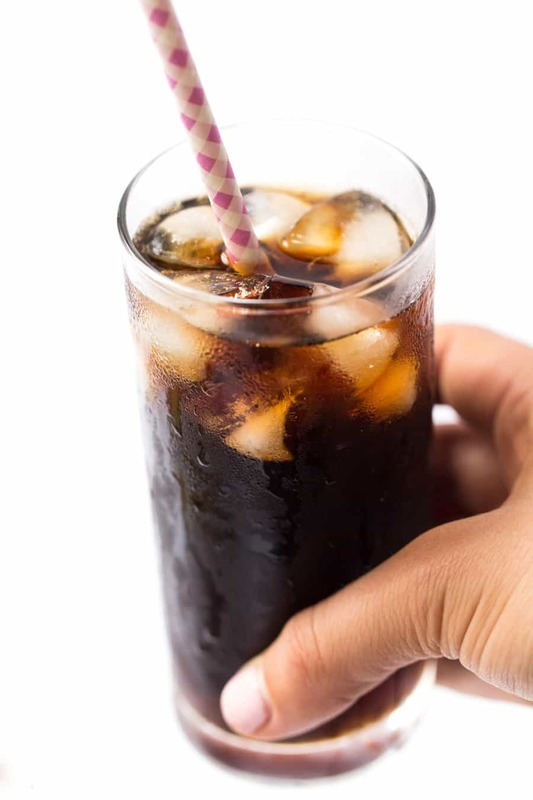 Starbucks has been making cold brew at their retail locations for a while, but since it's been so popular, it's almost always out when I look for it. So when I found out they released a ready-to-drink variety, I was pumped! This isn't like other bottled cold brews. The Starbucks Cold Brew Coffee comes in convenient 11oz bottles, which is the perfect amount for my morning walk, and it has a really rich, deep flavor. 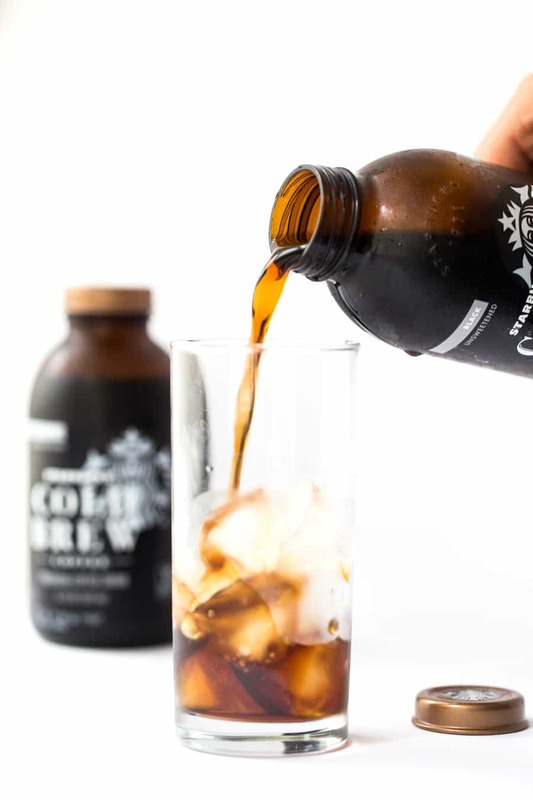 They steep their coffee using cold, filtered water, and this process, coupled with their unique mixture of ethically sourced beans that are chosen specifically for how they brew, the result is a full-bodied cold brew coffee with a hint of natural sweetness, a super smooth finish and just slight undertones of cocoa. A cold brew that is better than anything else I've tasted! I'm a firm believer that by being deliberate and using high quality, carefully curated ingredients, you can create something that tastes amazing, whether that's a recipe or product. Starbucks using this same craft/artisan approach with their cold brew, just as I take the same mentality when I'm approaching recipes. I want to show you that by using quality ingredients in your own cooking, you not only end up with a better tasting dish to enjoy, but you also end up feeling good about how you fuel your body. 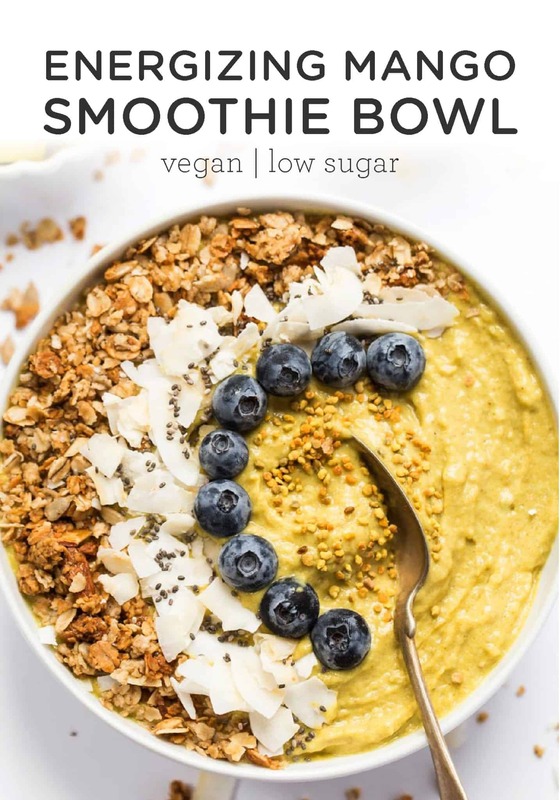 Smoothie bowls have been my post-walk breakfast of choice for at least the last 6 months. I absolutely adore that you can pack your plate full of fruits and veggies, and yet still feel like you're eating a bowl of ice cream. Plus, they're easy to make, they're filled with fiber which keeps you fueled all day, are easy to switch up based on what you have on hand, and are nutritious. 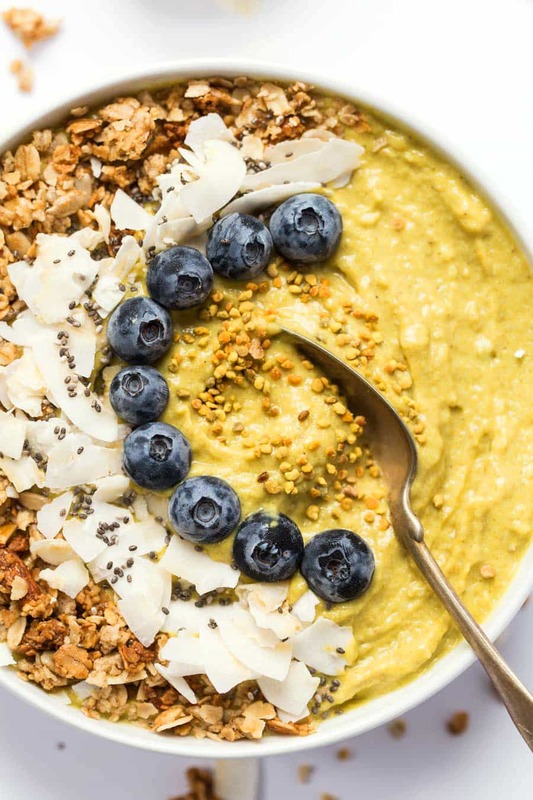 This mango smoothie bowl has everything we need to kickstart our day and keep us productive and motivated. And of course, almond milk to blend it all up and make it nice and creamy! So to circle back to the start of our post, creating a morning routine has been one of the best ways for me to keep myself accountable and help me manage and run a growing business. If I have those 5 things, I know it's going to be a good day! 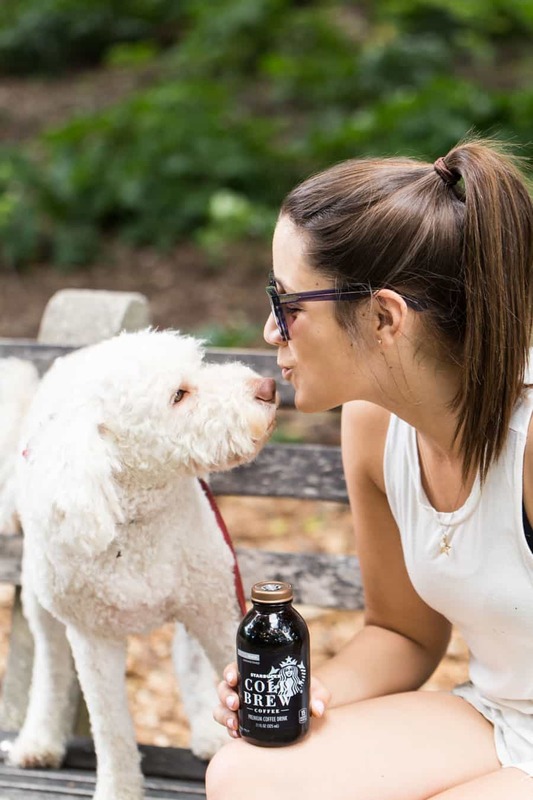 I hope you enjoyed this post and that it gives you some inspiration to start your day by treating yourself and actually dedicating time to your own health. 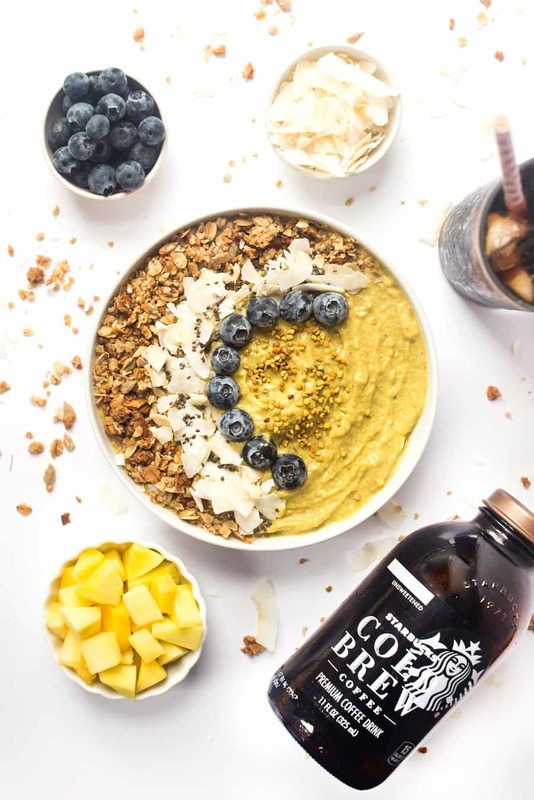 You deserve the best and by fueling your body with the best, you will set yourself up to have an amazing day! 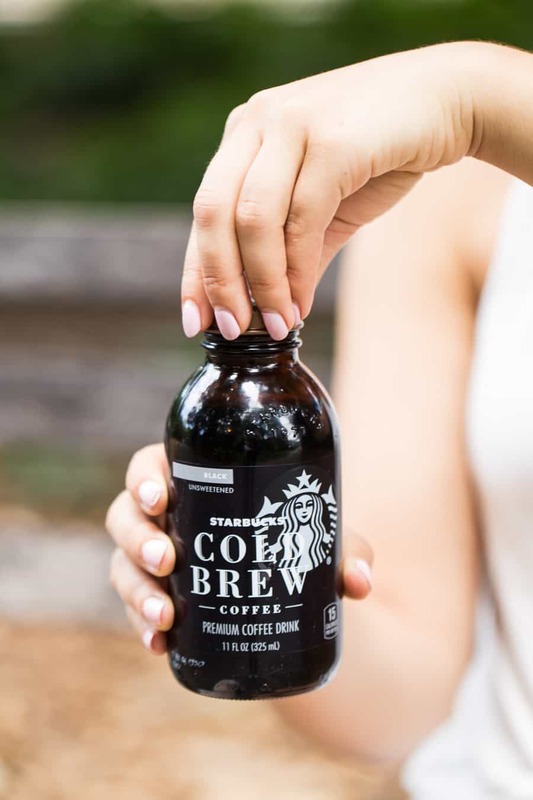 And if you're looking for a new cold brew to try, I highly recommend you go pick up some of the Starbucks Ready-to-Drink Cold Brew coffee – it tastes awesome and is deliberately brewed to give you a smooth taste. 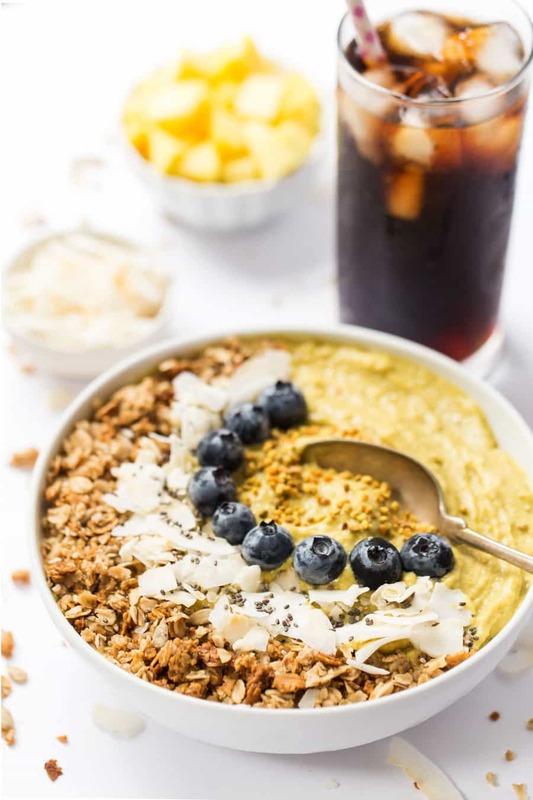 This energizing Mango Smoothie Bowl is made with fruits, veggies and superfoods to give you fiber, vitamins and a natural boost of energy in the morning! Add all ingredients to a blender in the order listed. Blend on high until smooth and creamy. Transfer contents of the blender to a bowl. Smooth over the top and add your toppings. 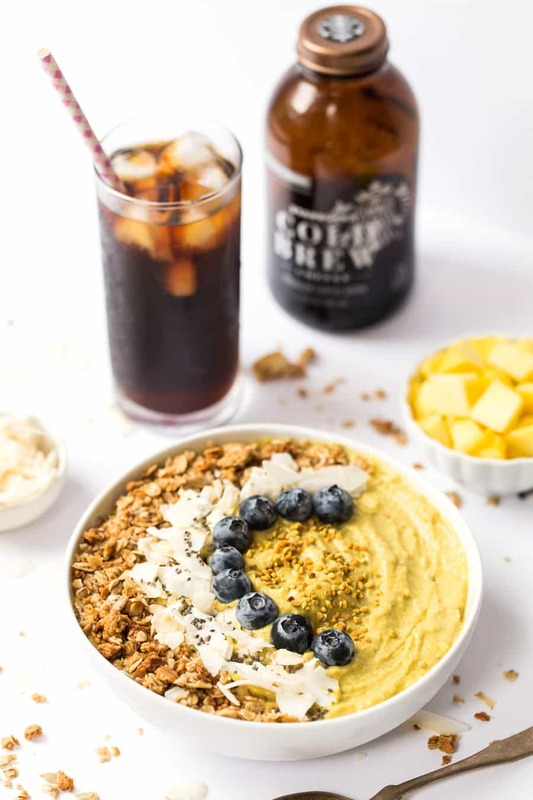 Dig in and enjoy with a cool glass of Cold Brew! Wow. 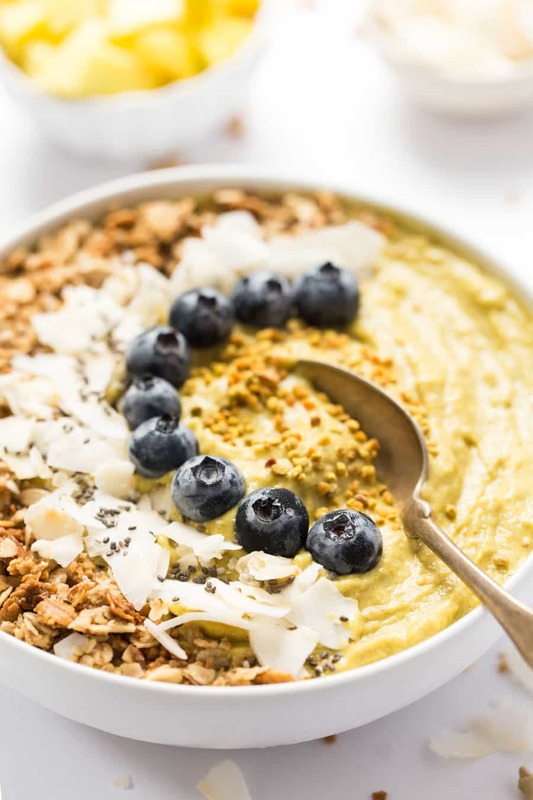 Great smoothie bowl recipe. I loved the pic I was on Pinterest I had to click. LOL. The picture for this look amazing. I am curious if the frozen veggies [like cauliflower] are cooked or raw 🙂 — new to your site but it looks like you have great recipes… very excited to try some! They can be either! If you buy them frozen in bags, most likely they are raw, but it would be easy to steam and then freeze. Steamed, then frozen would definitely be easier on your digestive system! Yum! This the perfect breakfast idea, Alyssa! It definitely seems to energize! 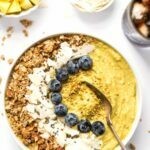 Mango is one of my favorite smoothie bowl ingredients!